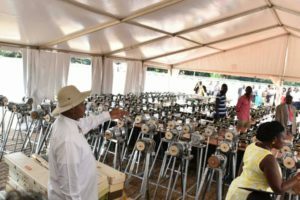 President Museveni commissions sewing machines for distribution. KAMPALA–President Yoweri Museveni has launched a Presidential initiative aimed at equipping young girls with technical skills. The initiative that kicked off last week will benefit girls from Kampala city. Youth minister Florence Kiyingi, in partnership with city church leaders have started registering the beneficiaries . House of Prayers’ ministries senior pastor Aloysius Bugingo told PML Daily that minister Kiyingi wrote to him, informing him that the President wants to help 100 young girls in his church. “It’s true the President wants us to register 100 young girls to be equipped with different skills. We screened them and we managed to pick the required number. But I told the minister to increase the number from 100 to 200 girls,” Pr Bugingo explained. According to Kiyingi, girls below 30 qualify to benefit from the scheme. The scheme, however, doesnt require one to have academic qualifications but must have a valid National Identity card. Some of the technical skills the girls will be equipped with include tailoring, catering, fashion designs , carpentry motor vehicle mechanics, electrical installation, welding and metal fabrication, block laying and plumbing. Ms Kiyingi said the move by the President to empower young girls is aimed at curbing the high unemployment rate in the city. “The future is now in technical courses,” she added. Last month, the President also pledged to build a government vocational school in Koch Goma in the memory of Prince Richard Benard Olanya Lagony, a former LRA peace envoy killed by rebels. Museveni, who was the chief mourner at a memorial prayer for the late Olanya in Koch Goma sub-county Nwoya District, said the deceased left a good legacy which the killers thought died along with him (Olanya), adding that good will always prevail over evil. But Opposition figures in the city say the move by the President to equip girls with technical skills is political. “President Museveni realized that the youth in Kampala city cannot support him. He appointed Beti Kamya as Kampala minister and Kiyingi to help him win in the next general elections. If we don’t respond to his action, we are finished,” said Ibrahim Kasozi, the Makindye East MP. Kasozi, who is also a senior member of FDC, said the scientific approach the President is using, should be countered in the same measures. The President’s programme to equip girls in the city with technical skills comes at a time when managers of 12 vocational institutes have just signed a Memorandum of Understanding (MoU) that aims at helping the national technical colleges to provide high quality, demand driven skills. The 10-year programme that started in 2011 is expected to run up to 2020. It is funded by the World Bank under the $100m Uganda Skills Development Project.